Learn more about some of these amazing new homes for sale that offer modern layouts and luxurious appointments. Our press section will bring you up-to-date on all of the Palm Springs and Coachella Valley real estate happenings. Builders wishing to become a part of the Coachella valley's premier new homes listing community may contact PMA Advertising directly by email, phoning 760.778.1313 or using our contact form. 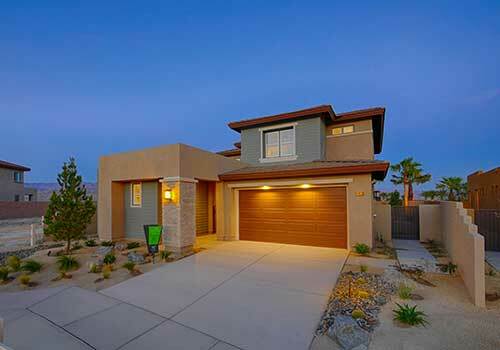 The new home community of Genesis in Palm Desert, has just introduced a new 1% down payment program for first time buyers. For buyers who thought they could not afford a new home, the builder GHA Communities has just introduced a new low down payment program aimed at first time buyers who have a Fico score of 700 or better and for all homes that are $428,000 and below. "With our affordable pricing, almost anyone can now buy a new home at our Millennium community located inside Genesis," stated Mario J. Gonzales, President of GHA Communities. "I urge anyone who felt they could not afford a new home, to come out this weekend and talk to Beverley or Colleena our sales team to see which house best fits their needs and see if they qualify under this new program." Genesis at Millennium when completed will offer 166 beautifully crafted homes in a 150+-acre master-planned community. "Genesis will be a part of an incredible new neighborhood that includes a mix of residential, retail, entertainment and commercial, along with a planned 27-acre community park," Gonzalez added. "These homes offer the latest in green energy saving features that also make a difference in the quality of owning a new home vs an older home." Millennia Series consists of 62 one- and two-story homes ranging from approximately 1,654 to 1,963 square feet, starting from $397,900. Core Series features 54 one- and two-story homes ranging from 1,871 to 2,301 square feet, starting from $428,900. Tesla Series offers 50 single-story homes ranging from 2,274 to 2,580 square feet, starting from $484,900. Luxurious amenities include attractive Shaker maple cabinetry, quality Moen plumbing fixtures, stainless appliance packages, convenient pantries, kitchen islands, granite countertops, porcelain tile in all principal living areas, plush bedroom carpeting, master suites with oversized spa tubs, luxurious showers and dual vanities. An optional 3-car garage is available. Genesis will offer a unique curb appeal with a mixture of elevations featuring Contemporary, Spanish, Craftsman and Mid-Century influence. Floor plans offer vast, open indoor/outdoor living space to perfectly accommodate family entertaining and today's busy lifestyles. GHA Companies offers the luxury of customizing options so buyers may personalize their homes to suit every unique need and taste. Palm Desert is the bustling center of the valley offering great schools, and the finest in entertainment, dining and recreational destinations, with world class shopping of El Paseo just minutes away. Check out our website then visit the Sales Center this weekend and tour the beautiful models.